After living on the Northwest coast of the US for nearly 40 years, I finally was able to go even further west than Cape Flattery. So in mid-June, we headed across the Pacific. Having never really spent much time in a tropical climate, it was a first in many ways. Something totally new for me was taking photographs underwater. I purchased a small Canon SX230 and an underwater diving case for it instead of taking "the plunge" for a case for my Nikon. Not 12 hours after our arrival, my sister and I went on a "see the dolphins in the water" tour not far from our hotel on the west coast of O'ahu in Poka'i Bay, Waianae. Spinner Dolphins are a delight to see. 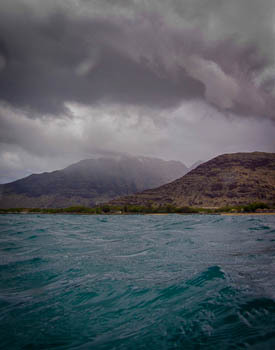 The weather was a bit stormy, which added to the drama. Some dolphins were doing their wonderful acrobatics and I wished I had packed my more capable SLR along for those shots from the boat. So, after lathering up with sunscreen, we jumped in the water. I had all new gear: mask, snorkel, fins, camera, case. In the waves and wind, jumping off the boat, it was a initially a bit overwhelming. Hadn't had a diving mask or snorkel on in any real way in 12 years. It was wavy, stormy, beautiful. Just what I like! I settled down into just the love in being there. It was truly a wow. After awhile, the weather cleared, and we were greeted with sun and some fleeting glimpses of the dolphins near the bottom in beautiful cobalt blue water. 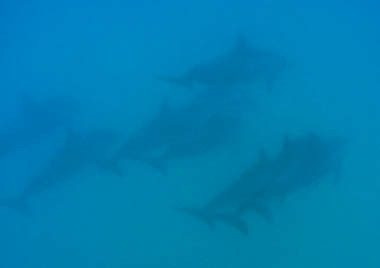 One could also view the dolphins from above, as these Japanese tourists. They even had their own flag flying. I was delighted to be in this fabulous water, surrounded by wildlife below. 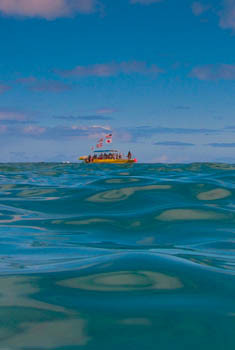 I was reminded of the ovoid patterns in the water found in the art of Northwest First Nations peoples. An interesting juxtaposition of thought for a moment. 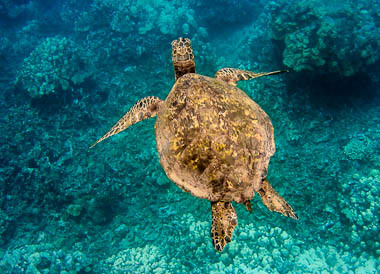 Next stop was off Makaha Beach and the Hawaiian Green Turtles having their bodies cleaned by the fish. 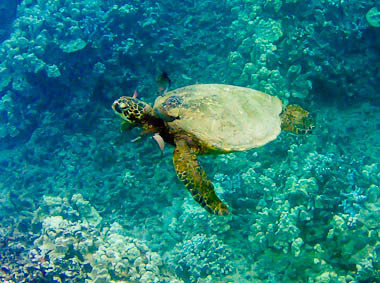 It was also pretty deep water here at this reef, but there were quite a few turtles and lovely fish. A turtle being in need of a the fish "carwash"
Photographically, it was quite a fast immersion, both figuratively and literally! I did wish I could have shot in RAW format, and occasionally needed better resolution at higher ISO's for faster shutter speeds when it clouded over, but most of the time I was able to shoot at iso100 to 200 to maintain reasonable image quality. Both the fish and turtles are moving as well as you, so minimums are in the 1/125 or faster range. Always used wide apertures.